Robinson Manufacturing is a market leading supplier of floor joists, from I Beams, to metal web joists and glulam beams. 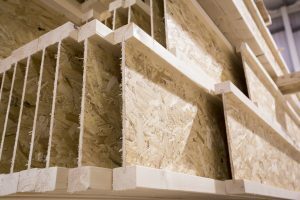 Design engineers use our floor design and layout software to determine the most commercially efficient joist solution for every individual build, whatever the scale. These could include I Beams, Glulam Beams or metal web joists – all of which arrive on site securely shrink-wrapped with their fittings. The metal web joist flooring system, with its open web design, is the most versatile floor joist in the market. Not only does it allow for the easy installation of services and mechanical heat recovery systems, it also offers the best acoustic performance comfortably outperforming all UK building regulations. Our experienced design team produce detailed layout drawings for approval as well as installation details, material call-offs, calculations and design quotations for any building footprint.